Had a tiny pocket of time with which to test a few things with my aforementioned dummy load I just build. In looking through my collection of junked wall wort power supplies I found a low power one, a 9V 210mA. 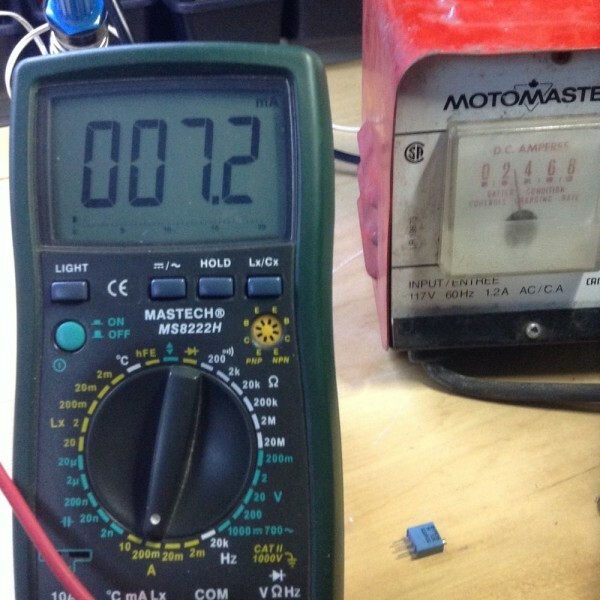 I wanted to check and see if the voltage headroom for the opamp would be worse. As it turns out, the stated 9V is actually 11.3ishV but whatever. I knew the supply would only need to deliver a few milliamps so I ventured to see how much exactly. That’s peanuts really, but I wouldn’t expect it to draw much current, at least not this end of the circuit. It simply powers the measly current needed to power the opamps and voltage regulator, with a very tiny amount of current to feed into the opamaps for the set voltage. I am a little concerned that it could use a volt or two more to be sure of getting that 3A from a variety of power supply voltages so I may up it a bit more to close the very small gap between my set voltage and voltage i’m reading off the shunt (and thus hit my design maximum). Easy thing that. Fortunately, I have quite literally a pile of wall worts kicking around so one of them will suit just fine or I can even replace it later if I am unhappy with it. I thought, well since I’m here, how about I test it’s thermal performance. My first run of this beast resulted in me melting a MOSFET and since then I have been testing it very gingerly and not leaving it on high current settings for more than a few seconds. I taped my thermocouple to the TO-220 package of the MOSFET (which of course is mounted on a large heatsink) and ran it full out. 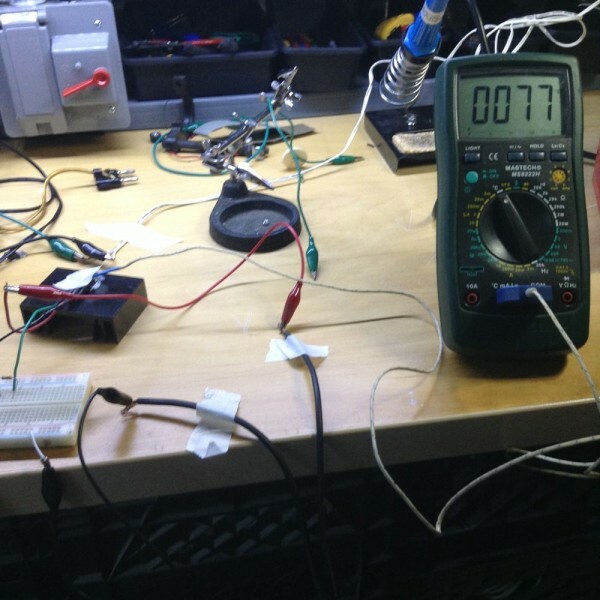 The temperature seemed to stabilize at around 78°C after a few minutes of operation. This is great news. It means my heatsink is sufficient. Though the device could theoretically stand up to 170°C I wish to go nowhere near that. 120°C case temperature is probably the outside maximum and I would definitely try for cooler than that. Obviously, more rigorous thermal tests will have to be done to really get a good idea of how hot it could get under heavy use. This also brings up the question of an enclosure. Ideally, I would very much not like a very hot heatsink exposed where my hands could touch it (yeeouch) yet enclosing it would hamper it’s heat dissipation unless I used active cooling. The circuit itself is quite small and I really only need panel space for the display, pot, a switch or two and a LED. This makes me not want to waste a large enclosure that will be mostly empty. I’ll think on it.